Notes Compound 3 (PMID: 24366037). AstraZeneca Alliance. Raubo et al. 2015. Bioorg Med Chem Lett. 25(16):3189-93. PMID: 26087940. 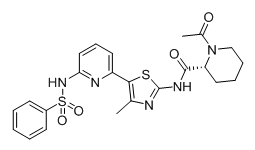 Discovery of potent, selective small molecule inhibitors of α-subtype of type III phosphatidylinositol-4-kinase (PI4KIIIα). Waring et al. 2014. Chem Commun (Camb). 50(40):5388-90. PMID: 24366037. Potent, selective small molecule inhibitors of type III phosphatidylinositol-4-kinase α- but not β-inhibit the phosphatidylinositol signaling cascade and cancer cell proliferation.